Ships in 2 - 3 days. Shimano XT trekking SPDs are designed for recreational riders who commute and tour. 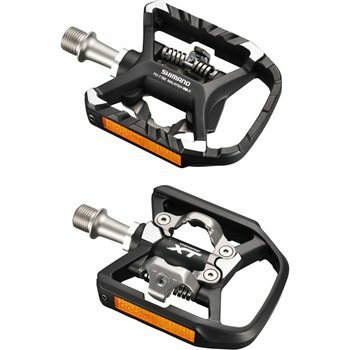 This XT trekking pedal combines SPD mechanism on one side and a stable platform pedal body on the other, you can ride with cleats or normal shoes. SPD has low profile platform height with large platform contact area for excellent support and stability. Lightweight and high performance using a forged alloy body and chrome-moly axle. 8 mm hex wrench mounting system. Sealed cartridge axle system for reliability and simplified low maintenance. Easy entry system with tension adjustment provides plenty of support and holds the cleat firmly in place. Built in reflectors for visibility.